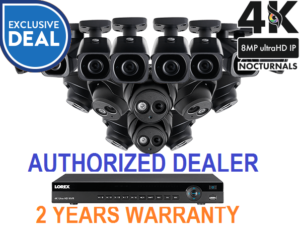 Protect your home and the people inside of it with this Nocturnal security camera system from Lorex. The cornerstone of this system is an eight-channel NR900 Series Network Video Recorder (NVR). Two bullets and two dome security cameras, both belonging to our brand new Nocturnal product line, then round out this bundle. 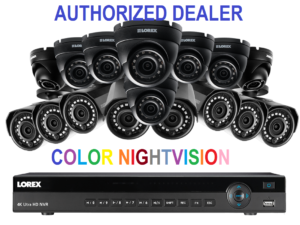 Along with 4K recording resolution, long range color night vision, extreme weather durability, both sets of these cameras add something special to your security monitoring. 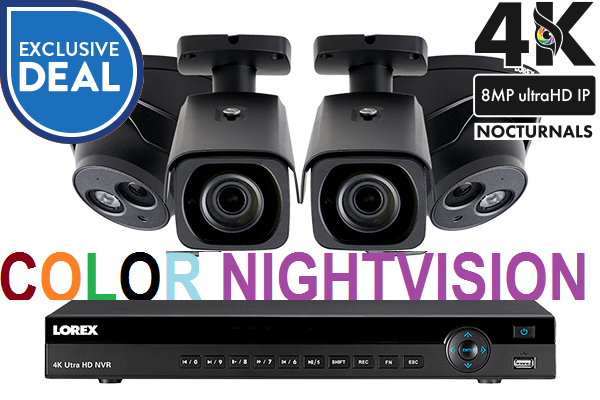 The two LNE8950ABW dome security cameras, for example, include a built-in mic for listen-in audio monitoring while the two LNB8973BW bullet security cameras come with a motorized zoom lens that lets you remotely adjust the viewing area and focus. A four camera system like this is perfect for any home, but with four open channels, additional IP cameras can be added to make it adaptable to any type of property. ABSOLUTELY NO TAX OR CUSTOMS DUTIES FOR CANADIAN CUSTOMERS! Learn the technology that ensures you capture the details you need. Easy PoE installation and other custom NVR settings to monitor smarter. Both sets of Nocturnal security cameras contain an 8.51 MP image sensor that is capable of recording 4K resolution video. This sensor will provide you with exceptionally sharp video that will give you the best chance to capture the distinct details (such as facial features or license plate digits) that you need from a security camera. 4K resolutuion has approximately 4× the amount of pixels as a 1080p security camera. The 4K cameras included here, for example, record at a pixel ratio 3840 x 2160. That’s a total of 8,294,400 pixels! A 1080p camera, on the other hand, records at a pixel ratio of 1920 x 1080. That’s 2,073,600 pixels, which is 6,220,800 fewer pixels than a 4K security camera. Ultimately, a higher pixel count such as this results in a much higher quality of video, with sharp definitive lines that distinctly outline every object and feature. It also allows for better digital zooms when you need to zoom into your footage. So when you spot something in your footage that you need to zoom in on, specific details will remain legible for longer as you zoom in further and further into the image. The bullet cameras in this bundle offer the longest night vision range available. With the help of some ambient lighting, the night vison range can reach up to a remarkable 250ft! The domes are no slouches either, with a night vision range up to 200ft. Adding ambient lighting, such as a porch light, will also allow these Nocturnal security cameras to see in full color at night. This provides you with a whole new layer of details, like the color of a car or the color of a person’s clothing. Standalone camera systems do not need the internet to operate. However, an internet connection will be necessary if you wish to use a smartphone, tablet or computer to access features such as remote monitoring. Easily watch live video feeds or review video footage on most Monitors or HD TVs by using the included HDMI cable. Security NVRs will connect to IP cameras using CAT5 network cables and will store pre-compressed video footage from IP cameras. 4K resolution offers four times the resolution of 1080p with approximately 4000 horizontal pixels, provides the maximum level of detail and clarity available. The hard drives are designed to work in a security environment, including simultaneous recording & playback from various streams. FLIR Cloud will help simplify and organize your life by keeping track of all your security cameras from anywhere in the world on any iPhone®, iPad® or Android® devices. ONVIF is an open standard protocol for IP Network Cameras to communicate easily with Network Video Recorder (NVR) devices. 1. 8MP IP cameras are required to take advantage of 4K recording. 2. Requires a high speed internet connection and a router (not included). A minimum upload speed of 3.5Mbps is required for the best video performance. Up to 3 devices may connect to the system at the same time. For the latest list of supported apps and devices, please visit www. 3. Recording time may vary based on recording resolution & quality, lighting conditions and movement in the scene. 4. 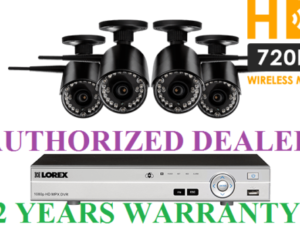 Compatible with Lorex PoE HD IP cameras only. For a list of compatible cameras, please visit www. 5. Mirror recording requires a second hard drive (not included) to be installed in the NVR. Mirrored hard drive must be as large or larger than the primary hard drive to backup all recordings. Backup begins from when the mirrored hard drive is installed and configured. 6. Both firmware and software must be updated to latest version to ensure remote connectivity. Firmware updates are pushed to the NVR automatically over the Internet (available at ). Always update to the latest software after upgrading the NVR firmware. 5. Not intended for submersion in water. Installation in a sheltered location recommended. 1. Stated IR illumination range is based on ideal conditions in typical outdoor night time ambient lighting and in total darkness. Actual range and image clarity depends on installation location, viewing area, and light reflection / absorption level of object. In low light, the camera will switch to black and white. 3. Audio recording without consent is illegal in certain jurisdictions. Lorex Corporation assumes no liability for use of its products that does not conform with local laws. All trademarks belong to their respective owners. No claim is made to the exclusive right to use the trademarks listed, other than the trademarks owned by Lorex Corporation. We reserve the right to change models, configurations or specifications without notice or liability. Product may not be exactly as shown. Images are simulated. Items are usually shipped from manufacturer warehouse within 1-4 business day(s). After shipping, items are usually delivered within 1-5 business days. Items may be returned within 14 days from the date of receipt. Items must be returned in exact condition it was shipped with all original box, accessories, books, etc. There may be be 15% restocking fee. 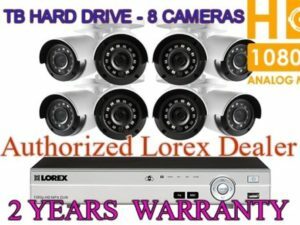 This item includes 1 year manufacturer warranty plus additional 1 year extended warranty for total of 2 YEARS MANUFACTURER WARRANTY.